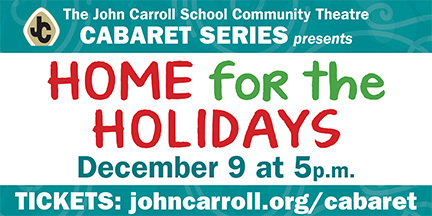 The John Carroll Community Theatre will present the first of its Cabaret series, “Home for the Holidays,” on Sunday, December 9 at 5:00 p.m. in the JC Auditorium. Come out for holiday entertainment from community and student performers. Tickets are $15 and include the Cabaret performance and light fare reception. Tickets are available for purchase online and at the door!